The Florida Keys Council of the Arts works to support all the arts, in all the Keys, all the time. The local arts agency is launching its seventh annual Connections Project Keyswide road show with a grand opening reception at the Murray Nelson Government & Cultural Center in Key Largo from 5:30 – 7:30 p.m. featuring a vibrant 24-foot mosaic mural created by local artists and art lovers. The reception with wine and hors d’oeuvres is open to the public. After connecting with the art, patrons can also collect art by making a $50 donation for one canvas or a $125 donation for three at any reception or online. Once the road show has ended, donors receive a randomly selected piece of the mosaic in the mail. Each work includes an artist statement providing insight into the origin of the work and the artist’s thoughts and inspiration. Proceeds from the Connections Project directly benefit Keys artists and arts organizations. 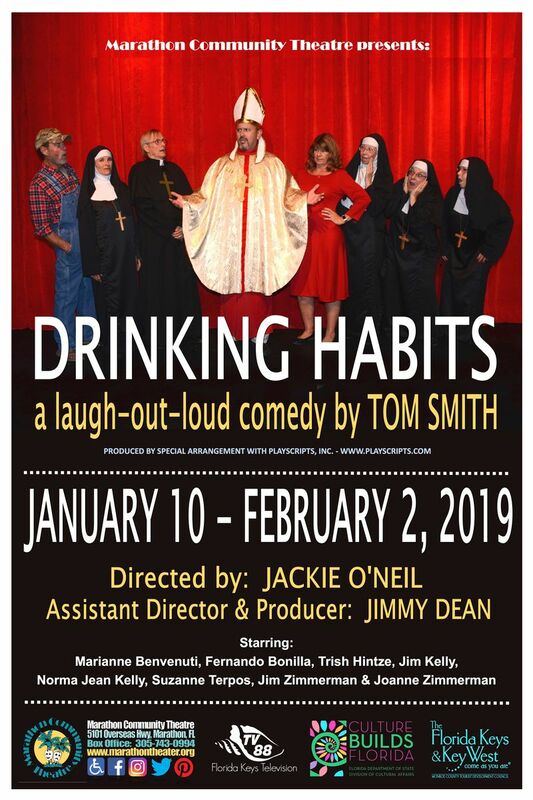 Marathon Community Theater presents: Drinking Habits Website Drinking Habits takes place during the early 1960s in the impoverished Oregon convent of the Sisters of Perpetual Sewing. Two nuns at the ‘Sisters of Perpetual Sewing’ have been secretly making wine in order to keep their poverty stricken convent afloat – behind the back of their alcohol-detesting Mother Superior. Unbeknownst to them, a local wine (theirs) has won a $500,000 award, and Paul and Sally, two newspaper reporters, who are ex-fiancés, are trying to discover the winning winery and break the story. The reporters go undercover as a nun and a priest, but their presence, combined with the arrival of a new nun, spurs paranoia throughout the convent that spies have been sent from Rome to shut them down. Wine and secrets are inevitably spilled as everyone tries to preserve the convent and reconnect with lost loves. Show times 8 p.m. Fringe Theater presents: Collected Stories, by Donald MarguliesRebecca Tomlinson 305-587-8961 Website Fringe Theater presents this gripping drama of two writers who grapple with betrayal. Is ownership of a story in its living or in its telling? Key West Woman’s Club, 319 Duval Street. Show starts 7 p.m.
Four new exhibitions open in January: O’Miami Poetry Retrospective, West African Portraiture, Portraits by Annie Dillard and Painted Photographs by Larry Blackburn. The public is invited to the opening reception Jan. 3, at The Studios of Key West, 533 Eaton Street for the First Thursday event from 6-8 p.m. Exhibitions by O, Miami, Rhonda Bristol, Annie Dillard, and Larry Blackburn fill all three floors of The Studios’ landmark building in Old Town. The shows remains on view through January 31. Gallery hours are 10am-4pm, Tuesday through Saturday. Fishing Key West Fishing Tournament Doris Harris 305-923-5934 Website Anglers of all ages and abilities can target more than 40 species of fish in the Key West Fishing Tournament, a free-entry multidivision challenge that takes place Jan. 1 to Aug. 31, 2019. The tournament features divisions for men, women, junior anglers ages 10 to 15 and Pee Wees under 10 years old — making it ideal for extended families and multigenerational groups who want to share the angling experience. Women and girls from around the world are to meet on the playing field for hard-fought sporting action. Each year, nearly 30 teams from across the United States, Mexico, Central America, Sweden and India participate. One boozy evening, fiercely competitive actress Ella and her father David deliberate over whether to read the reviews of her Off-Broadway debut… and things unravel from there. This darkly humorous sheds new light on the eternal struggle of parents and children to find common ground. Dates: Jan 23-27, Jan 30-Feb 2 (Wed-Sun) 8p.m. show, 533 Eaton St.
A Doll’s House, Part 2 is the continuation of Henrik Ibsen’s classic A Doll’s House. Far from being dry or stuffy, ADH, Pt.2 is hilariously funny, whip-smart and resonant to our gender politics. The story picks up 15 years after Nora famously slams the door on her stifling marriage at the conclusion of A Doll’s House. In Mr. Hnath’s updated version, Nora is now a successful business woman, who finds her husband, daughter and wise-cracking maid to be as changed as she has become. Fireworks explode as the play explores the rules of society and gender. See website for show dates. Show times 8 p.m.
Friends of the Key West Library presents young adult novelist Jennifer Brody at its popular Monday evening lecture series. The talk will take place at the Old City Hall, 510 Greene St. Brody is the author of the Continuum series of young adult novels: The 13th Continuum, Return of the Continuums and The United Continuums. Access to the Meeting Room at Old City Hall is at the front of the building by foot up a flight of stairs or by elevator located at the rear of the building. The Duval Loop bus has two nearby stops. Admission to the lectures is free. The talk begins promptly at 6:00 p.m. Seating starts at 5:30 on a first come, first served basis. While in Paradise, We Hope You Will Stay With US!